One of the most popular fixed restorative options, porcelain fused to metal crowns and bridges have a proven track record. Our ceramic crowns provide the esthetic translucency of handcrafted porcelain with the biocompatibility and strength of a cast metal understructure. Our PFMs can be used for crowns and bridges (up to fourteen units). 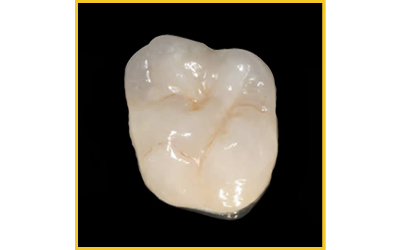 PFMs can be manufactured to non-precious, semi-precious, and yellow high noble copings and can be used in conjunction with cast partials and implants. D6752 Crown Porcelain fused to semi-precious (bridge units).